Like a mischievous illusionist armored with invisible magic wand, the city sprung surprises on its unsuspecting audiences time and again, silently transforming the least noticeable laneways into the most glorious hallways full of evocative images, almost always in the blink of a night. Once, Beaney Lane was that low profile bloke who intensely enjoyed its inconspicuous status without a whine or whimper. Carefully and without drawing too much attention to itself, Beaney Lane provided a quiet access to vehicle owners in search for parking spaces, or the nighttime partygoers craving for an exotic venue with a Middle Eastern touch (the glamorous Spice Market bar and cocktail lounge). Yet its secretive charm was soon discovered by a group of street artists. Beaney Lane is no longer that deserted place harboring no attractions of its own. Its vibrancy flourishes and captures the attention of all persons who casually swing by the south end of Russell Street. It presents a magnetic scene entrenched with an unspoken mysteriousness. 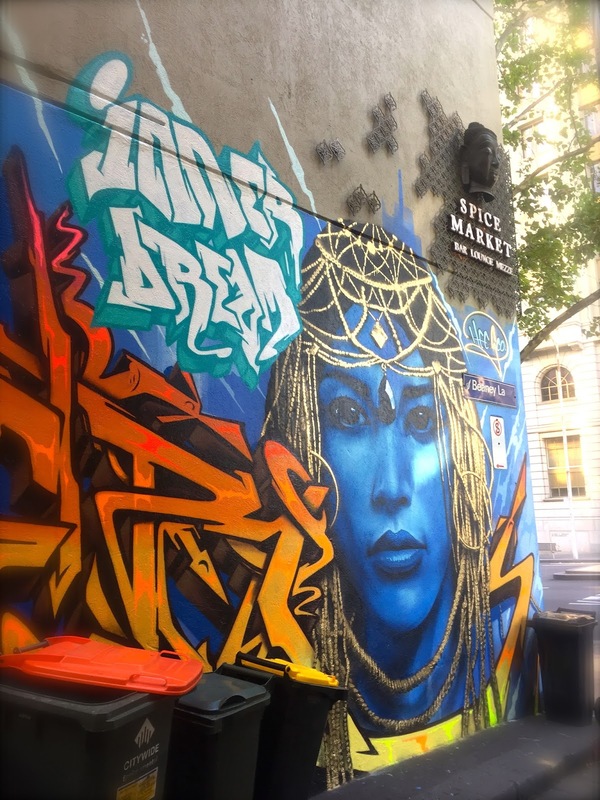 A pair of guarded, fearful green eyes hidden behind a veil of blue satin; Melbourne’s favourite realism artist Matt Adnate has once again created striking emotions within a static sphere of wall. Mongolian born artist Heesco painted a portrait of a very beautiful Asian model, with an enigmatic twist of blue complexion similar to a character from Avatar. Beaney Lane: off Russell Street, between Collins Street and Flinders Lane.